What: Actress, she will be performing the role of Clarisse in The Lightning Thief: The Percy Jackson Musical, which will be at Mahalia Jackson Theater April 13-14. Q: What’s a catchphrase you’d like to get rid of and also add into your life? SBP: The catchphrase ‘smile more’ is one I wouldn’t mind getting rid of. I would much rather have us all be our authentic selves. That way we can be present in the moment, and if you don’t feel like smiling then you don’t have to smile. A phrase I’d like to make part of my life comes from show. In a way, I think the phrase is actually the thesis of the show. It is in a song called ‘Strong’ that Percy’s mom sings to him, and the line is, ‘The things that make you different are the things that make you strong.’ That’s definitely something I live by in my life. I feel like my job in life is to find my weird tribe of people that love the things that make me weird. Then, together, we can change the world. I feel like a lot of artists have to cultivate their ‘weirdness.’ Everybody has a spark of creativity and their own weird brand of it, but I’m not sure that everyone fosters that and helps it grow. If you’ve committed to being an artist, you’ve committed to your weirdness. Q: Clarisse is a bit of a bully in the show, so how did you come to terms with her character and see where she is coming from? SBP: There’s a huge number in Act I called ‘Put You in Your Place,’ and Clarisse totally bullies Percy in that number. But by the end of the show, she’s ready to join Percy’s team and fight the monsters out in the world. Before that, though, what keyed me into Clarisse’s mindset is getting to do the ‘Put You in Your Place’ number full out. I’m singing really high, I am holding two swords, we are doing all this combat on stage, and I’m wearing knee pads and a big puffy vest. There is nothing like throwing yourself physically into a performance like that because you can’t do that halfway. By having to immerse myself in that number, I got insight into her as a character. And she is in really good shape [laughing]. I love exercise — I lift weights and do cardio — but I really have to step it up for this type of performance. Q: What is a book from your childhood you would like to see turned into a musical? SBP: My favorite book series growing up was Anne of Green Gables. Her wild imagination was always the key to that storytelling, and I think it would lend itself well to a musical. In fact, I feel like that musical might be in the works. If that musical did come to life, I feel like my Anne days are behind me [laughing], but I’d love a shot at playing her. Although, I kind of live in the middle of Anne and Diana, so maybe I could understudy both. Q: Clarisse is the daughter of Ares. If you had the option to choose your Greek God parent, who would you choose? SBP: I give props to Ares, but I would choose Athena. Annabeth, who is the daughter of Athena in the show has the catchphrase, ‘I’ve always been a smart girl,’ and that’s definitely been how I identify myself. I always did well in school; I love to read; and I have a big vocabulary that I even get made fun of for sometimes. I feel like the goddess of wisdom would be my jam. The way the books work, you get a human parent and a ‘God’-parent. So, I’d keep my parents and add Athena in. Q: What has surprised you the most while you’ve been on tour? SBP: We just played The Beacon Theater this last week, and it’s just shy of 2900 seats. We had almost sold out audiences every night, and the fans of this musical and the books are so incredible. We felt like straight-up rockstars, which is cool because The Beacon usually holds concerts, so it was boggling our minds to think about all the legitimate rock stars who had been on the stage we were now sharing. To stand on that stage and to hear the cheers of almost 3,000 people, who love and already have relationships with the characters that our writers, directors, and cast have worked so hard on honoring, is just amazing. There are also people in the audience who have never read the books, and we get to introduce them to this incredible story. So, all of that is just a dream come true. It’s hard to describe the feeling of being cheered for like that, and I always try to cultivate gratitude and stay grounded. It’s a wave of sound and emotion, but so many people who aren’t standing on stage to receive those cheers have done so much work to get us where we are. Theater is a community of collaboration, and that’s what I love most about it. Yes, I love being there to receive those cheers, but I’m also receiving that energy for all the people who have put blood, sweat, and tears into make the show amazing. 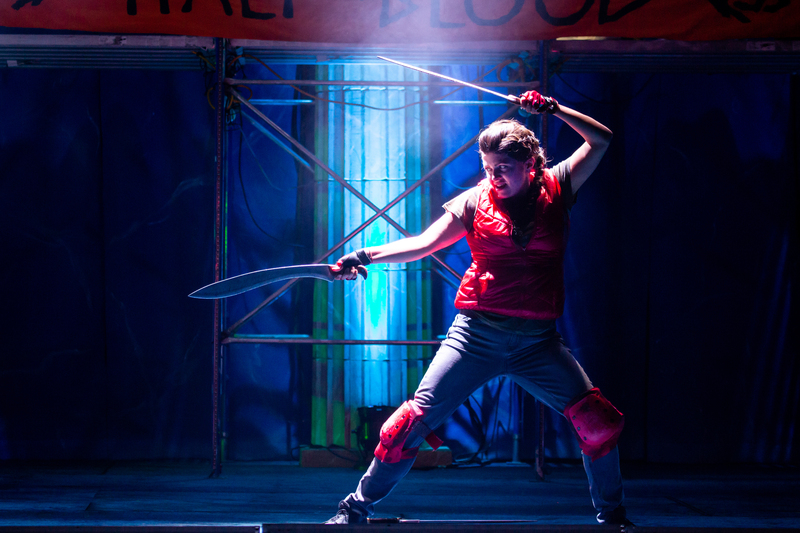 Sarah Beth Pfeiffer will be performing the role of Clarisse in The Lightning Thief: The Percy Jackson Musical, which will be at Mahalia Jackson Theater April 13-14. The shows are at 3:00 and 8:00 PM on Saturday and 3:00 PM on Sunday. For more information about the show and to get tickets, you can visit Mahalia Jackson’s webpage.